It has been known for several hundred years that sperm may be frozen and regain motility following thaw. Preserving the integrity of an embryo during freezing and thawing has been more of a challenge. However, through the 1940’s, improvements in cryopreservation technologies and its application to laboratory animals and farm livestock led to developments enabling these techniques to be used in humans. Assisted Reproductive Technologies (ART) using frozen sperm and frozen embryos has resulted in millions of laboratory animal and farm livestock births with no increase in abnormalities or defects. Attempts to use frozen sperm in humans began in the 1950’s, with the first successful pregnancy accomplished in 1953. Since that time, there have been hundreds of thousands of human births reported from the use of frozen sperm (this number does not reflect the total number of babies born from frozen sperm since the procedure is now so commonly used that most births are not reported as using such ART procedures). 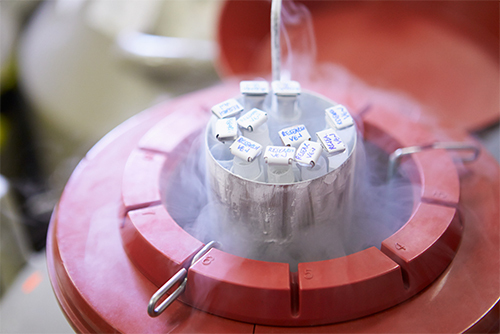 More recent advancements in human embryo cryopreservation resulted in the first birth in 1984, following an ART procedure in an Australian laboratory, using embryos that had been frozen for two months. The rate of abnormalities in children of naturally conceived pregnancies may be as high as 5%. Based on current scientific knowledge, there has been no evidence of an increase in abnormalities or birth defects in children born from frozen sperm or frozen embryo specimens. However, there is no indication that the birth defect rate will be decreased and no guarantee that a higher birth defect rate will not occur with the use of frozen specimens. Because variation exists with each patient, specimens from some individuals will not store as long or as well as specimens from others. The maximum time currently recommended, prior to re-evaluation, for storage of frozen sperm specimens is five years. However, births have been reported from sperm specimens that have been frozen and stored up to 15 years and, in our affiliated laboratories, from embryos frozen and stored as long as 7 years. The purpose of freezing and storing sperm and embryos is to establish a pregnancy at some point in the future. We devote our best effort to preserving the fertilizing ability of the sperm and integrity of the embryo. However, any individual submitting specimens for freezing and storage must understand that many factors beside the apparent ability of the specimen to survive freezing enter into conception. These factors include the partner, as well as other factors not related to the freezing and thawing process. Pregnancy with the frozen specimen, therefore, cannot be guaranteed. In order to attempt a pregnancy with the frozen sperm specimen, one of many ART procedures may be performed by a physician properly trained in this area. It will require precise timing of the partner’s ovulation and proper technique. It may take several attempts at assisted reproduction prior to achieving pregnancy, and for this reason, we suggest that multiple specimens be frozen. Pittsburgh Cryobank can receive specimens in the frozen state after they have been processed and frozen at other laboratories that are more conveniently located for Clients. If we did not perform the actual freezing process, we cannot be responsible for the quality of the specimen or the success of the freezing process utilized. In this case, the only information we have available are the prefreeze characteristics of each specimen and the results of any quality control tests performed at the freezing laboratory. Pittsburgh Cryobank will NOT thaw any specimen unless directed by the Client in writing. Our only responsibility in this scenario is to provide quality long-term storage and transportation of the specimen to the Client’s physician upon request. We emphasize that we cannot guarantee you will have a child with the specimens you cryopreserve. We assure you that we will employ our best efforts to see that the specimens are properly processed, stored, transferred, identified and/or returned in the most viable state. The American Association of Tissue Banks holds regular meetings to disseminate information on the most modern methods of tissue preservation. We will employ the best techniques available for cryopreservation of the specimens. However, we are aware of no certain standards by which the adequacy and suitability of specimens for freezing may be tested. Further, each person is unique and factors in the patient and in the patient’s partner will affect the probability of successfully achieving a pregnancy.